All booklets contain only Scripture— no commentary— just the powerful, pure Word of God! The topical booklets complement your Bible study. Each 32-page booklet is a handy 8-1/2 x 5-1/2 size— easy to stick in your purse or briefcase. A greeting-card quality envelope is included. There is a To/From page in the front of each booklet to personalize your gift. The cost is less than most greeting cards. SPECIAL PRICING: We want to bless you! 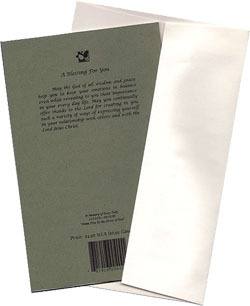 We have lowered the price of The WORD Applied Scripture booklets from $4.95 to $2.75 each. Order today and bless others, too! If you are not satisfied with your order, just return it within 30 days for a full refund. Click on the order form and print it, fill it out and mail it today! Order Form link says page not found. Thanks for letting me know. I will check that out.